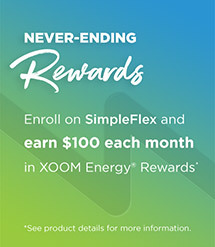 Earn $100 each month in XOOM Energy Rewards* when you enroll on SimpleFlex! 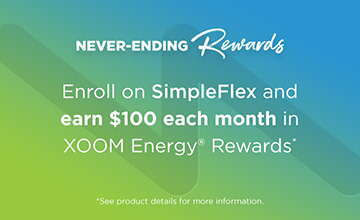 SimpleFlex offers you the freedom and flexibility you want in an energy plan with the added bonus to earn $100 each month in XOOM Energy Rewards*. With XOOM Energy Rewards, you can choose how to use your rewards in over 500,000 ways, including purchases for popular apparel, restaurants, hotels and more! Available to residential customers only. After the promotional period, this rate may change in the subsequent months at the sole discretion of XOOM Energy. XOOM Energy's charges will be reflected on the monthly bill you receive from the utility. Only the utility account holder or persons legally authorized on the account may enroll. If you are currently under a contract with a retail supplier, understand your obligations and rights before switching. *To qualify for the XOOM Energy Never-Ending Rewards program you must be an active customer on the SimpleFlex product each month. Customers must remain active and in good standing on all qualifying accounts to be eligible. XOOM Energy customers are active when electricity service is flowing. Should you choose to change your plan to a fixed rate plan, you will no longer qualify for the XOOM Energy Never-Ending Rewards program. XOOM Energy Rewards will be sent via email each month to the email address associated with the customer’s account. XOOM Energy is not responsible for lost, stolen, damaged or undeliverable rewards or items purchased through the XOOM Energy Rewards site. XOOM Energy Rewards do not expire. Other restrictions may apply. Reward enrollment and online/mobile redemption are required before use of the rewards. Rewards are not gift cards or certificates and they have no cash value. Participating offers subject to change. 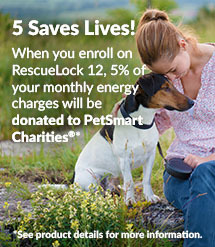 For full terms and conditions visit www.XOOMEnergyRewards.com. *You will pay a flat monthly charge, plus taxes and fees, for your electricity supply. The amount of your flat monthly charge will be determined by your annual historical usage as provided by your local utility and is set forth in the chart above. If your historical annual usage is over 24,999 kWh you will not be eligible for the plan. You will continue to be responsible for all charges assessed by your local utility for all delivery and other services it provides, including any other fees or taxes specifically associated with services it continues to provide during the term of your Agreement. 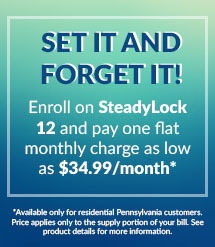 Available only for residential Pennsylvania customers. Please see your Terms and Conditions for more details.